The Crown Villas are the ultimate in luxury and exclusivity, as each is a small estate home with sumptuous, private three and four bedrooms that offer guests a unique and exclusive vacation experience. All of these villas are a classical Spanish Mediterranean style architecture, with red tile roofs, stucco plastered archways and distinguished stone columns with generous tropical gardens where hibiscus, bougainvilleas and other magnificent tropical plants abound. All have a private swimming pool, shaded terrace, veranda, kitchen, and a full private bath leading directly off each bedroom. The villas are furnished with rattan, elephant bamboo and a natural Caribbean wattle work and are equipped with air conditioning, overhead fans, and cable television. The Crown Villas are part of the all-inclusive Lifestyle Holidays Vacation Resort and guests have access to all the facilities of the Resort (excluding the V.I.P areas). A personal maid and an exclusive menu in each of the seven Resort restaurants complete these perfect accommodations. 3 Bedroom Villa - This unit sleeps 4-6 people. 4 Bedroom Villa - This unit sleeps 6-8 people. 5 Bedroom Villa - This unit sleeps 8-10 people. 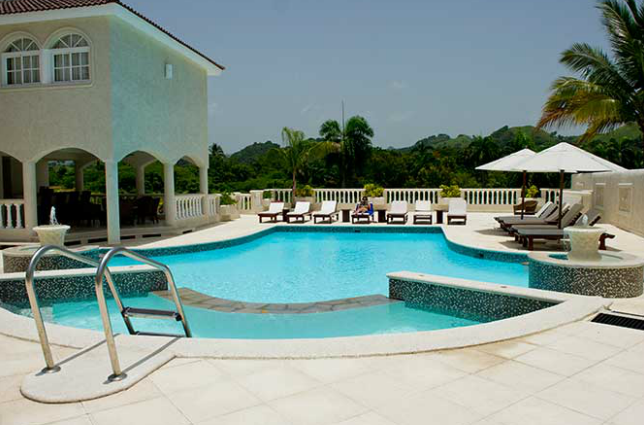 6 Bedroom Villa - This unit sleeps 10-14 people.